Gone are my days of wearing an itty bitty teeny tiny yellow polka dot bikini—yet summer has arrived and the beach calls my name. But who really wants to shop for a new bathing suit? 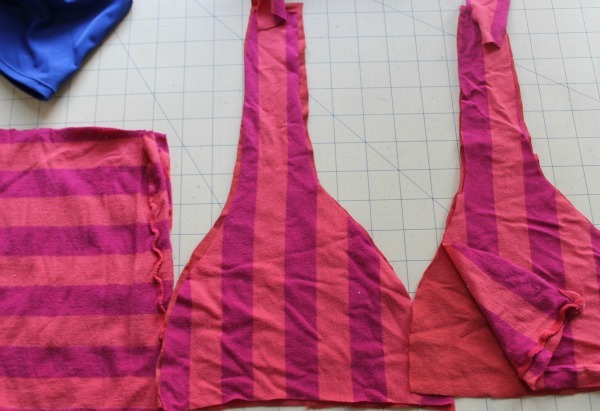 Today I’m going to share a quick and easy teekini tankini bikini (say that 10x fast!) that can be made with materials you already have on hand—two t-shirts, a pair of scissors, elastic, and a needle with thread. Do you have a bra, bathing suit top, bottom, or skivvies you like the fit of? Use these as starting point to trace your pattern. Once finished I had the pieces drawn out for my top. Tip: Remember to add seam allowances. 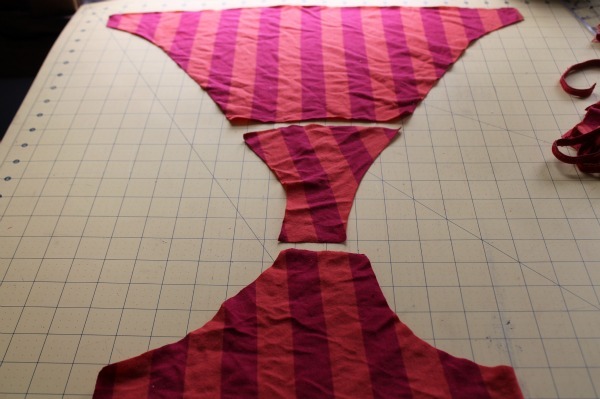 Trace this rough pattern onto two pieces of t-shirt, then flip the pattern over and trace/cut out a second set. 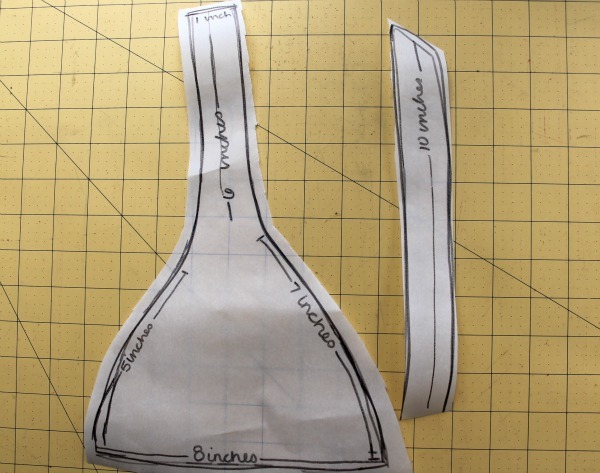 You’ll also need to cut out four 1″ x 10″ rectangles for the straps. Next I cut out the bottom half of my tankini. 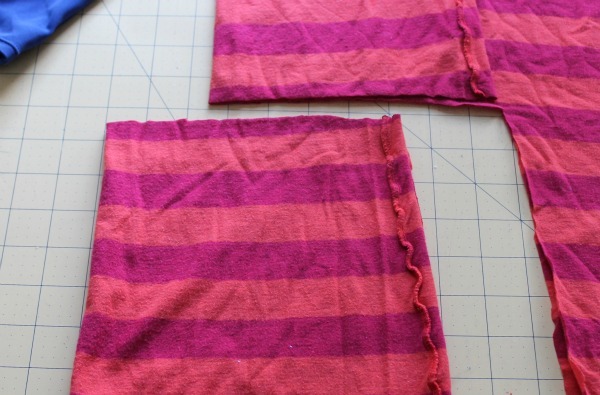 Tip: Reduce the amount of sewing/hemming by using the bottom and side seams when cutting out this piece. I doubled up on my layers for the top and bottom pieces and recommend using darker colored/printed/patterned t-shirts. This helps to reinforce the fabric and adds thickness. Take your top (bra-like) pieces and with right sides facing, sandwich two of the 1″ x 10″ rectangles between them; these will serve as your neck ties. Tip: Pin the rectangles in the middle so that they don’t get caught in the seams. Pin to hold in place and sew around the outside edges of the top, leaving the bottom edge open for flipping. Snip corner and curved edges. After you finish sewing the straps together, turn the pieces right side out. Slightly overlap the top triangles to create a V neckline. Pin in place. With right sides facing, align the top triangles with the bottom rectangle. 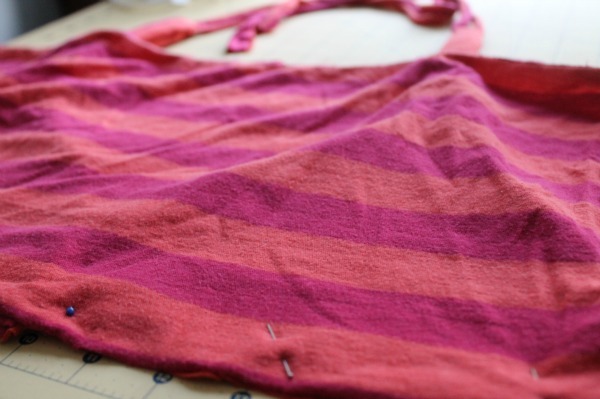 Use a serger, zigzag, or stretch stitch here. Sew the side seam, and you’re nearly finished with the top. Adding a length of elastic helps add a little definition and support to the top. 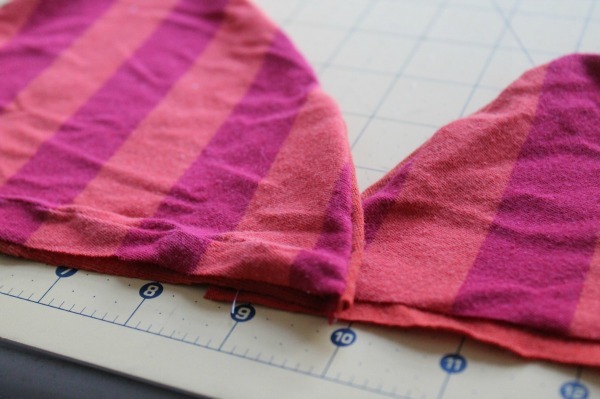 Tip: Cut elastic 2/3 of your under-bust measurement. Stitch the ends together creating a loop. Sew the elastic directly over the seam utilizing a triple zigzag stitch (also known as a tricot stitch). It’ll appear on your stitch index like a dotted-line zigzag or similar. 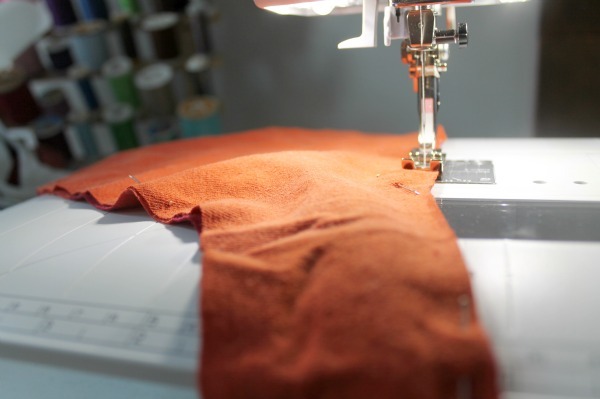 Sew your elastic onto the facing seam, all the way around the top edge of the bottom piece. I disassembled a pair of bottoms by first removing the elastic waistband and leg bands. (Cut on seams so they can be reused! )I traced and cut out my pieces, with double layers for the front and middle but not the back side. Tip: Remember to add your seam allowance! 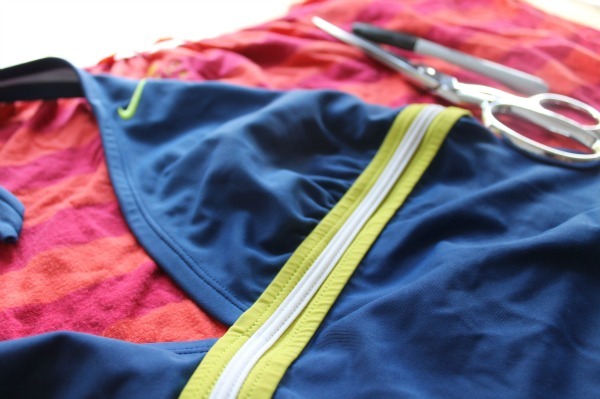 Reconstruct your bottoms, putting them together the same way your cut-apart bottoms were stitched. I chose to add a the little tie bows after finishing up – they’re made by folding a t-shirt in half and cutting out 3 inch long leaf shapes. Sewing with knits can be quite intimidating but it’s also really forgiving and you don’t have to finish the seams (knits won’t fray!) This bathing suit alternative is perfect for wading around the kiddie pool and sun bathing but I personally don’t recommend boogie boarding in the Pacific or rope swinging into the Delaware River while wearing it! Where else are you going to find a customized swimsuit tailored to your shape and style for less than $5? Raid your closets or head out to the nearest thrift store today and make your very own easy teekini tankini bikini! You can find the no sew tshirt skirt/cover up tutorial on the TrashN2Tees Blog.